I would like to thank all the sponsors that made my trip to Camp Colorado possible. 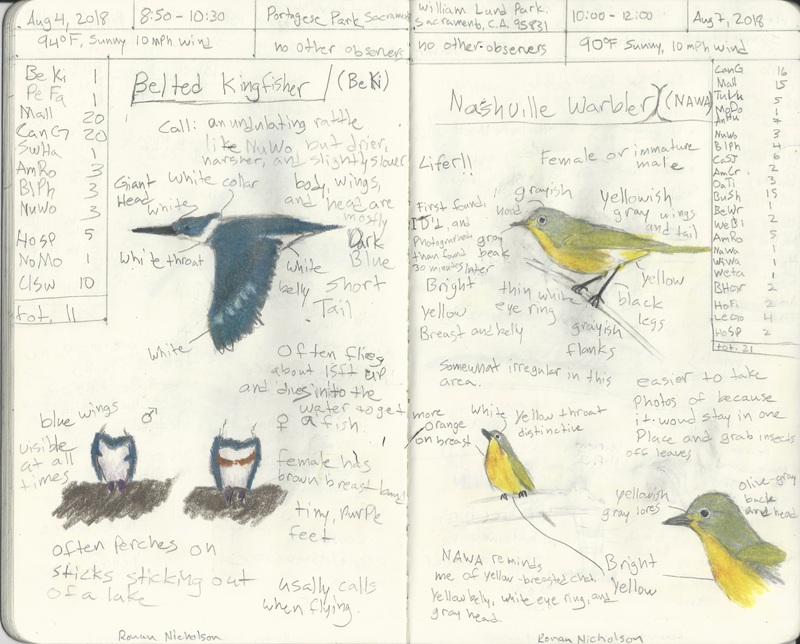 During my time at camp, I made new birding friends, met professionals in the field, and learned to be a better birder overall. As a CVBC scholarship recipient, I attended the first Camp Colorado of 2018 for young birders. 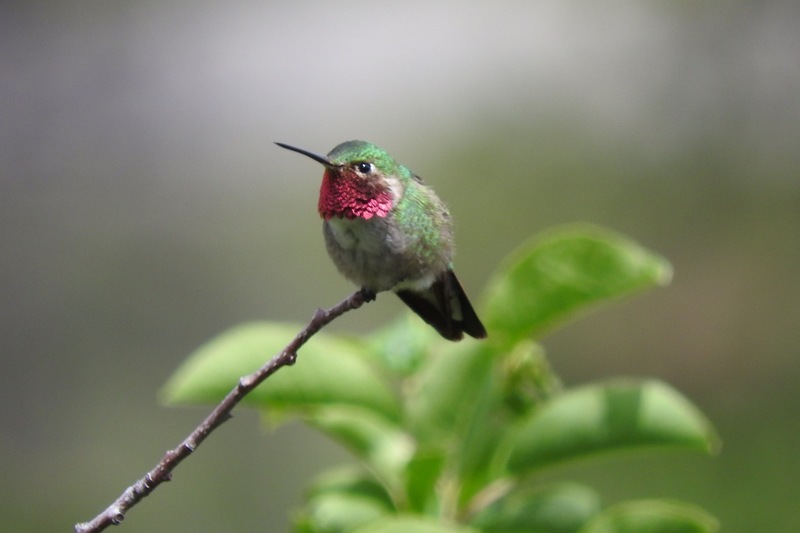 Held at the YMCA of the Rockies and situated next to Rocky Mountain National Park, I birded with a group of 17 teenage birders for a whole week at the end of June. 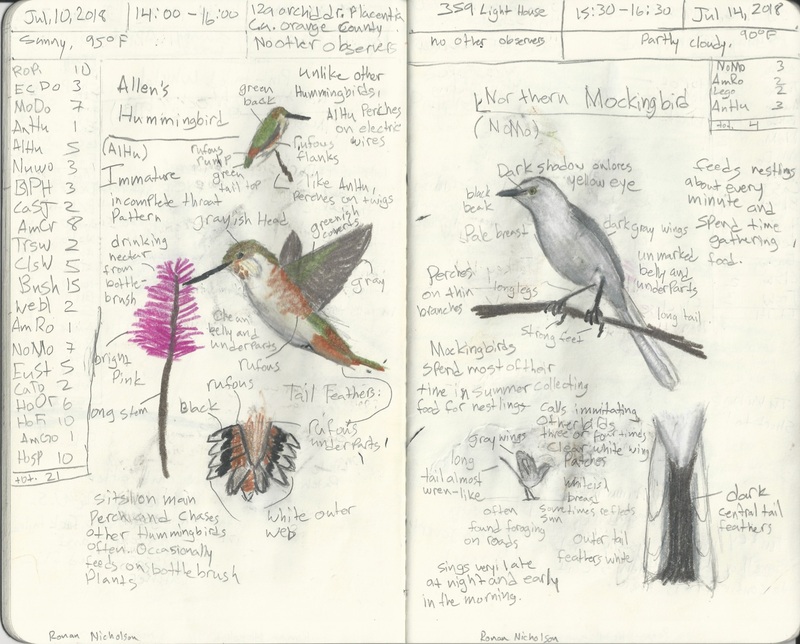 As one of the youngest (13 years old) and the only birder from California, I was able to connect with other birders close to my age while learning about birding in Colorado and other parts of the country. 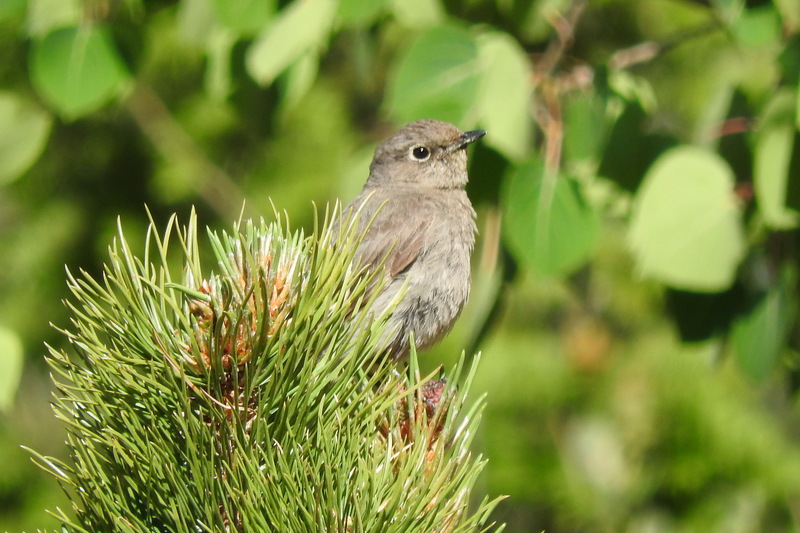 During my week at camp, I observed 126 species with 25 of them being life birds. At the time, this brought my life list to 266. Some of the more notable birds I saw includes a White-tailed Ptarmigan, a Northern Saw-Whet Owl, Brown-capped Rosy-Finches, Northern Goshawks, and a Prairie Falcon. There were also many other highlights to my exciting week at camp. One evening after dinner, all the campers got into the vans and went to another part of the YMCA to look for owls. As we were walking down the road, we passed enclosures with horses in them. We finally reached the edge of an oak forest and a green field where nighthawks were swooping and eating insects. Everyone stopped to listen for owls. Once one started calling, a camp leader called back, imitating the series of hoots given by a male Northern Saw-Whet Owl. Defending its territory, an owl came to fight another male. However, instead of finding an adversary, he found our camp leader and flew into his forehead. The disoriented saw-whet then landed on an exposed branch where it was spotlighted and photographed. Finally, it left and decided to hunt somewhere else where there were no camp leaders to get in its way. This happened to be the only nocturnal owl we saw during the camp. For the Camp Colorado Challenge, our group was to identify as many species as possible in a single day. Over this 16 hour period, we visited mudflats to see burrowing owls, horned larks, and possibly an endangered mountain plover. The first mudflat we visited provided a view of a flock of the horned larks and that uncommon mountain plover; a lifer for most of the young birders on the trip. On the second mudflat, we identified the burrowing owls and another seventeen plovers. On the third flat, we just drove by to see another six plovers, including two chicks resting in the shade of a telephone pole. Altogether, we saw 23 plovers, which later we discovered were about .01% of the world’s population. After birding for about 5 hours in the morning, we would eat lunch in the field then come back to the YMCA and were given time to rest until the next event in the evening. During that time, a group of five or six campers would meet in the hallway of Rainbow Lodge and go down the hill on the other side of the lodge and go birding. We would either watch a pair of Pygmy Nuthatches feed nestlings in a grove of aspen trees, or take photos of a Yellow-rumped Warbler  feed an immature Brown-headed cowbird, but usually, we would sit in the forest in front of a large pine tree with rows of sapsucker holes hoping to find a Williamson’s Sapsucker that was supposed to be found there. Once as we were leaving, a Northern Goshawk started circling above the YMCA, after watching it for a minute, we started back again, but stopped to see a Green-tailed Towhee flush into a tree on the side of the hill. 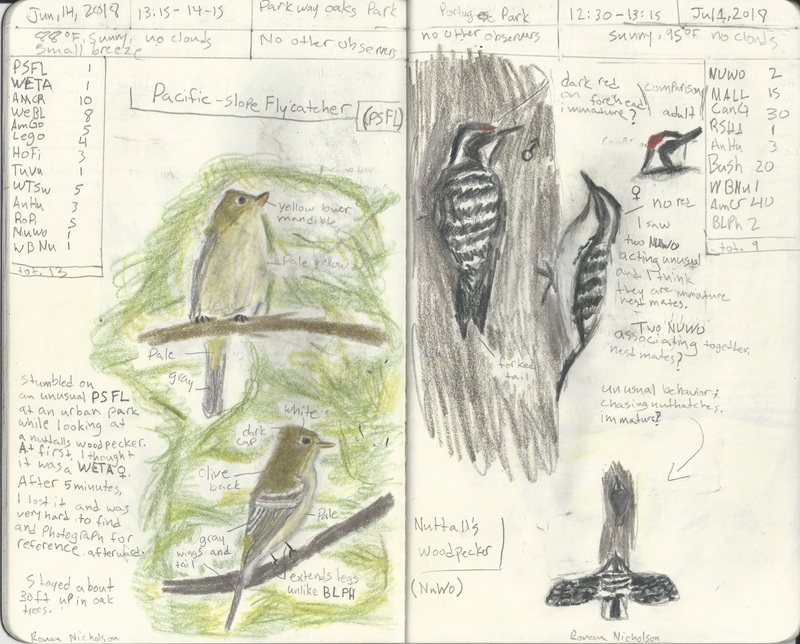 This year, I am participating in the ABA Young Birder of the Year contest, a national competition held between April 15th and October 1st for teenage birders. During the camp, I met 2 of the judges for the contest. One of them was Rafael Galvez, our instructor for a class on field sketching. The other was Ted Floyd, an accompanying leader on the last day of the camp. 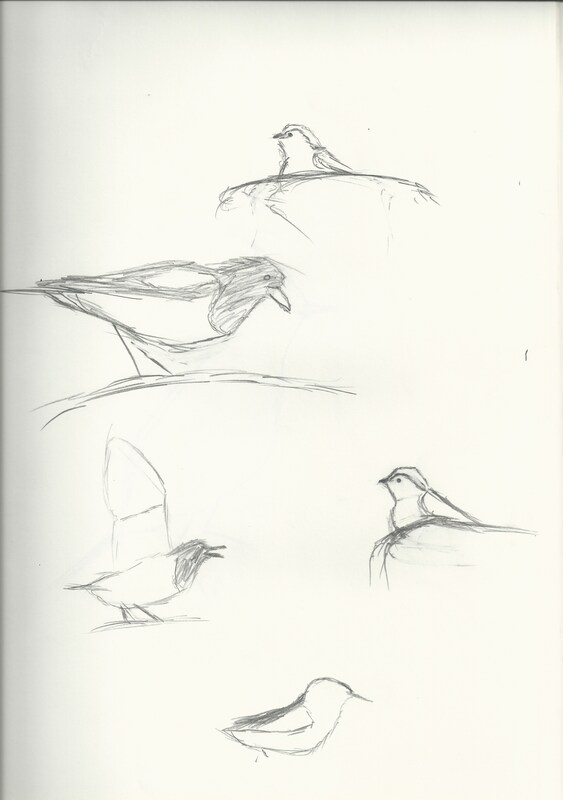 From them, I learned how to sketch and identify birds more easily. 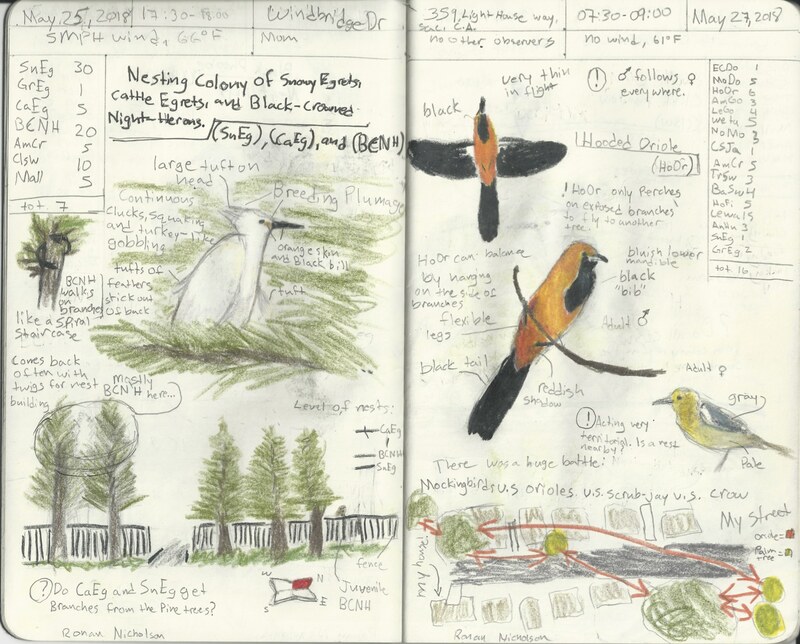 I will always remember this camp experience with other young birders and new lifetime friends. In the future, I would like to study wildlife biology and photography.